US #4789 features a photograph taken for the 1963 album Ring of Fire: The Best of Johnny Cash. On January 13, 1968, Johnny Cash put on a concert at Folsom Prison. The resulting album that was recorded that day revitalized his career. Cash first became interested in Folsom State Prison (America’s second-oldest prison) when he was in the US Air Force Security Service. During that service in 1953, his unit watched Crane Wilbur’s crime film, Inside the Walls of Folsom Prison. Cash was so inspired by the film that he penned a song, “Folsom Prison Blues,” that captured his idea of prison life. Released in December 1955, the song was a big hit, especially with prison inmates. In fact, many prisoners wrote to Cash asking him to come and perform at their prisons. Cash eventually agreed and performed the first of several prison shows at Huntsville State Prison in 1957. US #4789 FDC – 2013 Cash First Day Cover with Digital Color Postmark. In the years after the release of “Folsom Prison Blues,” Cash had continued success with hits such as “I Walk the Line” and “Ring of Fire.” But over time his popularity declined, hindered further by his drug use. In 1967 he was determined to turn his life around and sought help for his drug abuse. Cash also saw this as a great time to return to performing prison shows. His record label contacted San Quentin and Folsom. Folsom responded first, so that’s where Cash would make his comeback performance. 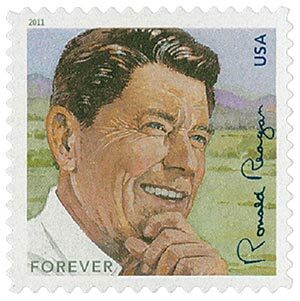 US #4494 was issued for Reagan’s 100th birthday. In the days before the concert, Cash, his girlfriend June Carter, the Tennessee Three, Carl Perkins, and the Statler Brothers met in the El Rancho Motel for rigorous rehearsals. During one of these rehearsals, California governor Ronald Reagan, who was at the hotel for a post-dinner speech, stopped in and offered the group words of encouragement. Among the songs they practiced was “Greystone Chapel,” a tune written by inmate Glen Sherley. US #4789 – The full mint sheet was designed to resemble a 45rpm record sleeve. On January 13, 1968, Cash and the group put on two shows at 9:40 a.m. and 12:40 p.m., in case the first performance didn’t go well. Each show began with Carl Perkins performing “Blue Suede Shoes” followed by the Statler Brothers. 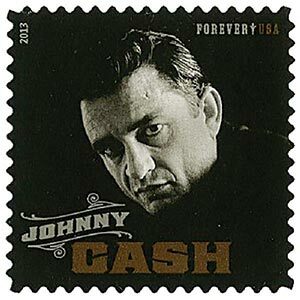 When Cash took the stage first performed “Folsom Prison Blues,” before playing other songs about prison. Because Cash and the others were tired from their first show, the second wasn’t as strong, so only two songs from the second performance were used on the eventual album. US #1770 was taken from a family photo suggested by Mrs. Ethel Kennedy. At Folsom Prison was released in May 1968 and proved to be the hit Cash needed. However, it was soon at the center of controversy. 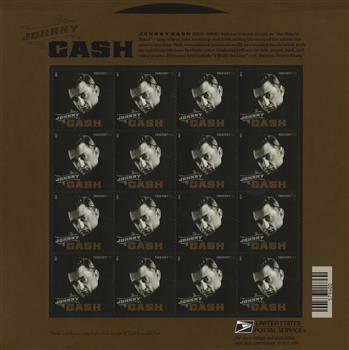 That June, after Senator Robert F. Kennedy was assassinated, radio stations refused to play “Folsom Prison Blues,” because of the line “I shot a man in Reno just to watch him die.” Cash’s record label wanted the line removed, though Cash protested. It was ultimately removed and the song was an even bigger success, reaching number one on the country charts. The album was certified gold that August for selling over 500,000 copies. The album also received rave reviews and Cash credited its success with revitalizing his career, saying, “that’s where things really got started for me again.” The following year performed another prison show at San Quentin, and that album was his first to hit number one on the Pop chart. Click here to see photos from Cash’s Folsom Prison visit. 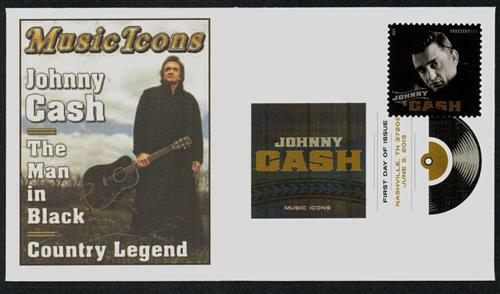 4 Responses to "This Day in History… January 13, 1968"
Can a person buy six Johnny Cash stamps? Yes. 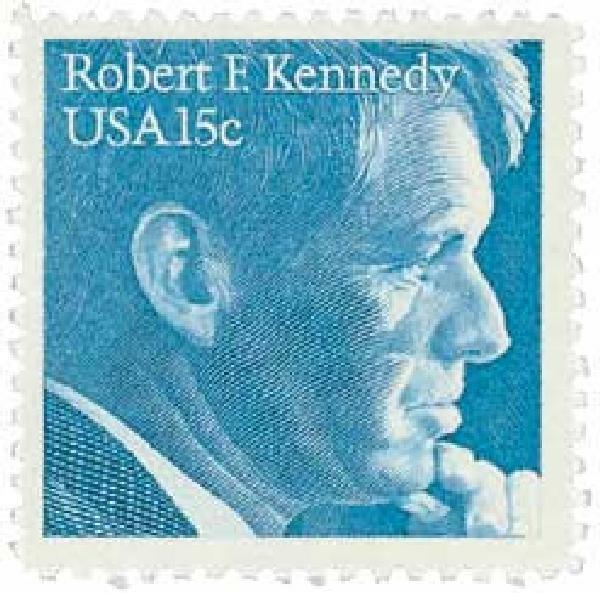 Just click on the image of the stamp and enter a quantity of six in your shopping cart. You have to credit a person for overcoming their demons, in this case drug abuse.